This phrase is often associated with the image of three monkeys covering their eyes, ears, and mouth. Confucius, who is credited as the message’s originator, defined it as a warning to avoid all things evil or distracting that can hinder a person’s development. Similarly, The Yoga Sutras, as organized by Patanjali, describe the fifth limb of its eight-limb system that is yoga. Through the sutras, we learn that pratyahara means to withdraw your senses. Like a turtle that retracts inside of its shell, pratyahara will teach you to go inside yourself and retreat from the external “noises” that exist around you: the opinions, the interruptions, the distractions, the associations, the influences. Once you detach from this commotion, you can be free to choose the sensations that you wish to introduce into your field of awareness. As the summer solstice approaches, now is the perfect time for seeking solitude for yourself. Periodically remaining quiet increases your awareness and lets your mind rest. Your challenge this week will be to receive solitude by spending time alone each day. Walking in nature or watching the sunset or sunrise are good ways to soak up some solo time. Also, consider your speech and how much you talk. Curtail your urge to speak a bit this week to bring more reflection and centeredness into your life. Or, you can choose to be in solitude with others by practicing the concept of mouna or silence. A good time for this is just prior to or following a meal. Another effective time is the first thing in the morning or the last thing before sleeping. If you live with others, make this “silent time” a period for eliminating the television, computer, or any other device that produces sound. For 10-15 minutes (and ear buds plugged in do not count), try to keep the silence with reading, drawing or writing. Eventually, slowly phase out these activities and find a comfortable place to just be still together. During this time, consider your thoughts and observe what surfaces. This is a great prelude to meditation. Performed on a regular basis, mouna becomes an important tool for generating increased awareness. The yama of asteya or non-stealing in the form of words, can also be a consideration for keeping the virtue of silence. When you practice silence, your thoughts become quieter, and, ultimately, you will find that you are able to pacify your emotions and soften your personality. On this the new moon, I would like to introduce you to a process for going within, for moving from your outer world to your inner world. It is the ultimate quieting technique called the Ritual of the Moon. And it goes hand in hand with our quest for clarity. This technique will release your mind and your body thoroughly so that you can move into the lunar world. Begin the process an hour or so before you would like to go to bed. Sit somewhere quiet and reflect on your day. Rethink what has occurred and release any emotional tensions that may have been created. Apply wisdom and compassion as you see yourself as you truly are. Without harming thoughts, re-balance yourself. Prepare your body for sleeping: take a bath, practice restorative yoga, listen to meditative music or just sit & breathe. Fall asleep as slowly as possible. This sounds tricky, I know. But the idea is to maintain your self-awareness as you descend into sleep. This won’t happen if you stay up too late and fall into bed exhausted. As you perform the ritual each night this week, journal your thoughts and feelings. You are learning to form a more meditative mind. One that will cultivate great self-awareness and much health and happiness. As you might try a jewel in your hair. With one first-water start almost shining. I put it shining anywhere I please. The color run, all sorts of wonder follow. As we continue on our purification journey, it is important to remember that the mind requires cleansing as well as the body. In our quest to create a clear path, we should seek to avoid all things that are destructive and unhealthy. This is tremendously important for our state of mind. Mind purification or saucha is a deep subject. In order to begin, we need to remove the congestion and false perceptions. The first step in this challenge is to view things as they truly are through healthy detachment. As we move through life, negative emotions are all around us and inside of us. This way of thinking can become toxic to our minds. Therefore, we should attempt to detach from negative thoughts and feelings. Quiet and focus the mind on a negative idea/feeling that you hold onto. Acknowledge this attachment. Then see it as a separate entity – this thought/feeling is not who you are. Place it to the side and see yourself without this burden in your life. In this way, little by little, we can learn to put aside attachments such as greed, fear and any other unhealthy desires. A mental pathway free of negative emotions leads to keen self-awareness. The next step is to create more compassion for your mind. As I have reiterated in class many times: “We are here to learn from one another, with one another and through one another…” – a valuable quote from Goswami Kriyananda that defines compassion in a nutshell. Share the benefits of your practice with those around you – not by trying to get them to do yoga or insisting that they make changes to their lives – but by respecting, accepting and viewing others with non-judgement. Removing obstacles and living with compassion for self and others provides a clear channel for your health, your joy, and your sense of purpose. Valentine’s Day is the perfect occasion to delve into the heart of our yoga practice. Yoga is strongly connected with the word “Namasté”. Translated as “the light within me salutes the light within you,” the expression is associated with a specific gesture – the bringing of the hands together so that the thumbs can press toward the heart. We usually use this gesture when we begin or complete our practice, however, this same action may also be used in Tadasana (Mountain Pose), before we begin Sun Salutations, or in balance poses such as Vrksasana (Tree Pose). This sacred hand position is known as anjali mudra (AHN-jah-lee MOO-dra). Anjali means “offering” and mudra means “seal” or “sign”. In general, anjali mudra is used as a posture for returning to one’s heart; whether you are greeting someone or saying goodbye, initiating or completing an action. In class, we salute ourselves and each other and give thanks for our efforts, the teachings and the benefits that the practice brings to us. Symbolically, as you bring your hands together at your heart center, you are connecting the right and left sides of your body as well as your active and receptive natures. Therefore, anjali mudra connects us with the true meaning of the word yoga, which is to unify or yoke together. Today, on Valentine’s Day, honor the light that is within your heart. Take this opportunity to reflect on the love that you hold deep inside and share that devotion with others. I have been doing lots of reflecting during this first week of the new year. 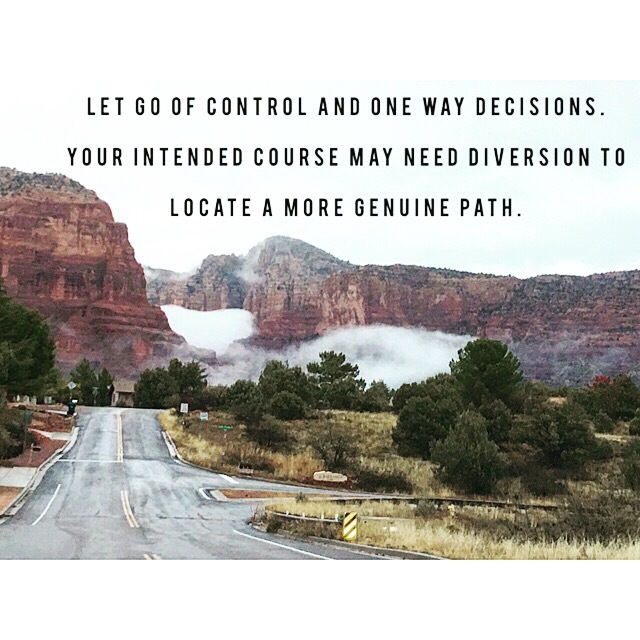 Our constantly changing Sedona scenery has prompted this recent realization. Letting go and allowing all things to take their course never rang so true. Have a wonderful weekend and let yourself float to the next juncture. This is another simple challenge but one with great depth and meaning. The spirit of which can be cumulative and far-reaching. To invoke is to call earnestly for, to implore, to appeal. Far from a wish, it is a prayer. Not for a divinity but for a universe of people who need an invocation to empower them. Send this message out to the world by chanting it silently. Use it at the end or beginning of each yoga practice so that it may purify your heart. May all beings everywhere be happy and free and may the thoughts, words and actions of my own life contribute in some way to that happiness and to that freedom for all. Namaste friends – may you have a blessed New Year!